Unchecked germination of Aspergillus fumigatus spores in the lung results in invasive pulmonary disease (background). To study how the innate immune system fights such infections in native tissue environments and at the resolution of encounters with single spores, the Hohl Lab and colleagues engineered a fluorescent Aspergillus reporter (FLARE) system that traces fungal fate and measures fungal killing in vivo. 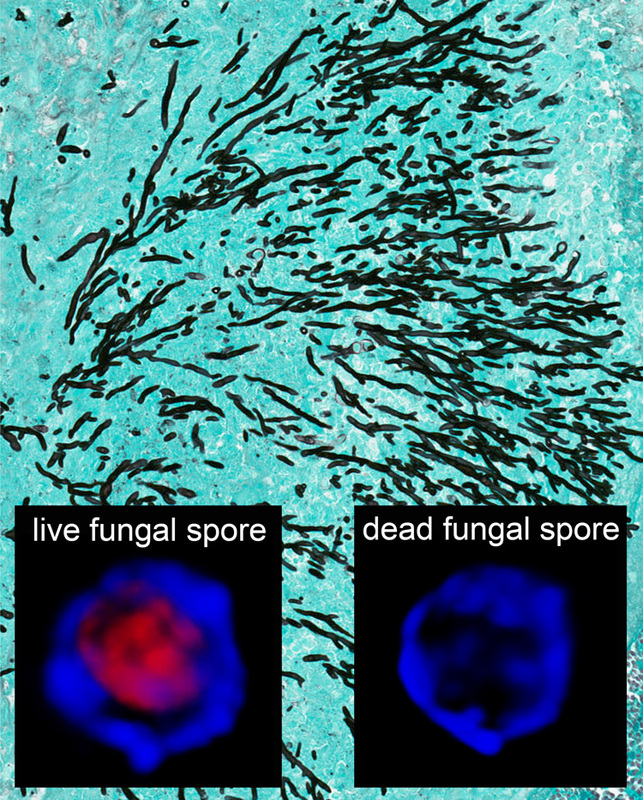 Fluorescent images at the bottom represent live (left) and killed (right) spores. Advancements in fluorescence imaging over the past two decades have facilitated many breakthroughs in cell biology. Green and red fluorescent proteins, cloned from jellyfish and corals and improved through molecular engineering, can be expressed in other organisms for live-cell imaging. Fluorescent labels of nearly any color can be conjugated to highly specific antibodies and other binding proteins to visualize a cell's internal components or to sort cell types via flow cytometry. Dynamic imaging of in vivo infection has yielded insights into the localization and tissue burden of pathogens, as well as the identification of certain host cell-pathogen interactions (Coombes and Robey, 2010). Once fluorescently-labeled microbes are killed, however, they often lose fluorescence rapidly and become invisible to the scientists studying them. This has made it difficult to track the microbicidal activities of cells that make up the innate immune system — an organism's first line of defense against infections. In a recent study from the laboratory of Dr. Tobias Hohl (Vaccine and Infectious Disease Division), Dr. Anupam Jhingran and co-authors tackled this challenge by engineering Aspergillus fumigatus to fluorescently report both living and dead states (see figure). They then applied their new technique to investigate fungal lung infection in mouse strains for which key genes of the innate immune system had been manipulated. Aspergillus fumigatus, which belongs to a family of conidia-forming molds, is widespread in the environment and plays an important role in carbon and nitrogen recycling. Every person likely inhales several hundred A. fumigatus conidia, or non-motile asexual spores, each day, though the rate of exposure can be much higher when raking leaves or mixing compost. The innate immune system of a healthy individual readily eliminates conidia from the lungs. Nevertheless, A. fumigatus can lead to invasive infections of the lungs and other tissues, called aspergillosis, in individuals who are immune-compromised due to disease or immunosuppressive drugs. Indeed, aspergillosis is a leading cause of death in stem cell transplant recipients and individuals with acute leukemia (Latgé, 1999). As summarized by Jhingran et al., multiple lines of evidence indicate that caspase recruitment domain adaptor protein 9 (CARD9) and spleen tyrosine kinase (Syk) play important roles in signaling and antimicrobial functions of the innate immune system. Yet, the specific roles of these proteins in leukocyte recruitment to, and phagocytosis of, inhaled mold conidia are still not well understood. To investigate the roles of Syk and CARD9 in the sequestration and killing of A. fumigatus conidia by leukocytes, Jhingran et al. first confirmed that their new fluorescent Aspergillus reporter (FLARE) system distinguished live from killed conidia in the native lung environment. When dead, a spore only fluoresces due to a fluorophore that is covalently linked to its tough outer surface. When a spore is alive, this outer marker fluoresces along with an internal reporter protein, the expression of which depends on living cellular machinery. They also showed that conidia-engaged leukocytes could be distinguished from bystander leukocytes that had not engulfed conidia. During these tests of FLARE's performance in mice, they observed that neutrophils were the predominant subset of leukocytes that engulf and kill conidia. The authors then mapped CARD9- and Syk-dependent anti-conidial activity of neutrophils by combining FLARE with experimental infections in knockout mice lacking genes for these and other proteins. This revealed that CARD9 regulates neutrophil influx into lung tissue and helps mediate optimal neutrophil phagocytic and conidiacidal activity. In addition, Syk was found to regulate the uptake of conidia by neutrophils as well as the cytotoxic activities of both neutrophils and alveolar macrophages. This recent research by members of the Hohl Lab and their collaborators elegantly demonstrates the use of paired fluorescent labels in pathogens for investigating how the innate immune system fights infection at single-encounter resolution. Although this conceptual approach is potentially broadly applicable to understanding innate immune responses toward a variety of microbes at different portals of entry into the body, it can be most readily translated to other conidia-forming molds. Infection with these opportunistic molds can occur in immune-competent individuals via contaminated medical products, as illustrated by a tragic outbreak of fungal meningitis in 2012 caused by Exserohilum rostratum (Kaufman et al., 2012). Infection by related mold species via inhalation or cutaneous inoculation can cause mucormycosis, fusariosis, or scedosporiosis in immune-compromised individuals. FLARE is a powerful new tool for investigating these opportunistic pathogens at high spatial and temporal resolution in native tissue environments. Jhingran A, Mar KB, Kumasaka DK, Knoblaugh SE, Ngo LY, Segal BH, Iwakura Y, Lowell CA, Hamerman JA, Lin X, Hohl TM. 2012. Tracing conidial fate and measuring host cell antifungal activity using a reporter of microbial viability in the lung. Cell Reports 2:1762-73. Also see: Coombes JL, Robey EA. 2010. Dynamic imaging of host-pathogen interactions in vivo. Nat. Rev. Immunol. 10:353-64. Kauffman CA, Pappas PG, Patterson TF. 2012. Fungal infections associated with contaminated methylprednisolone injections  preliminary report. N. Engl. J. Med. Epub ahead of print, 19-Oct-2012, doi:10.1056/NEJMra1212617. Latgé JP. 1999. Aspergillus fumigatus and aspergillosis. Clin. Microbiol. Rev. 12:310-50.